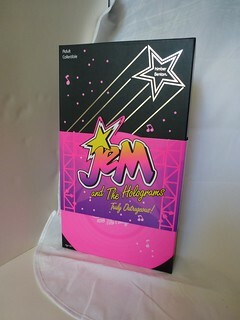 Integrity Toys debuted their Jem and the Holograms line (under license from Hasbro) at San Diego Comic Con 2012 with Hollywood Jem. The first series, consisting of Classic Jem, Jerrica Benton, Rio Pacheco and Synergy, came out in December 2012. The second series was released in Spring 2013, featuring the three original Holograms: Kimber Benton, Shana Elmsworth, and Aja Leith. Kimber is one of my favorite Holograms. She’s Jerrica Benton’s younger sister and her opposite in many ways: impulsive, sentimental, extroverted and prone to squeaky exclamations of “Out-RA-geous!” If there’s a case of royal mistaken identity or a romantic triangle or a shotgun wedding, Kimber’s likely to be in the middle of it. Kimber’s outfit is pretty faithful to the original toy and her cartoon model, with some improvements… she actually has a full blouse on under her white jacket. And I can’t say enough good things about her gorgeous lace socks. On the other hand… those pants. I’m guessing this was an attempt to simultaneously make a nod to the 80s trend of acid-washed jeans while ALSO avoiding actual denim, as denim can easily stain doll bodies. 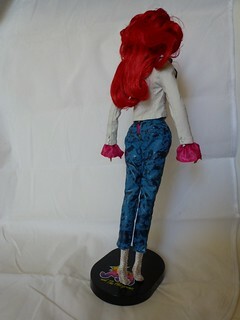 The end result is a pair of soft pleather pants printed with an acid-washed-denim pattern, with a metal hook closure in the back that gaps enough that the back of her pink blouse peeks through. In good news, the second series of Jem and the Holograms dolls have significantly less pre-applied hair product than the first series dolls. Some of the dolls in the first series arrived with sad, flattened backs-of-heads due to the limitations of the packaging… and while Kimber has slightly flat hair in the back, it’s not nearly as stiff and unyielding as the earlier dolls. 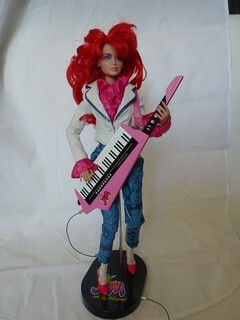 One of the most memorable Jem episodes (for me, anyways) was “Scandal”, in which Kimber’s diary plays a vital role. 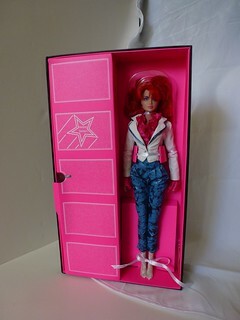 Since the first series of Jem and the Holograms dolls included many paper accessories, I was a little disappointed to see that we didn’t get a cardboard cut-out of Kimber’s diary, or the lyrics that she writes for the Holograms. On the other hand, it’s not hard to see where the budget for the accessories went! 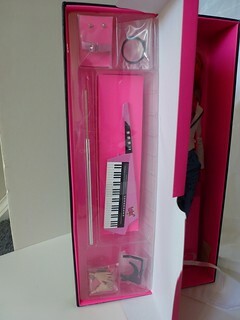 Kimber’s accessories (tucked away in a compartment modelled to look like a dressing room door) include her earrings, her pumps, a spare set of hands, stand parts, a keytar that plugs into her stand, and a strap for her keytar.